If you’ve read my special report on how to improve your English, you know that I recommend you do a lot of listening and reading. (And if you haven’t read my report, hurry up and get it today by signing up below). (1) Read something you can understand. If you can’t understand more than 90-95% of the words on the page, it’s too difficult. Find something easier. (2) Read something you enjoy. If you are bored, you won’t read it for very long. Books written for younger readers are easier to understand, but still have interesting topics and themes. 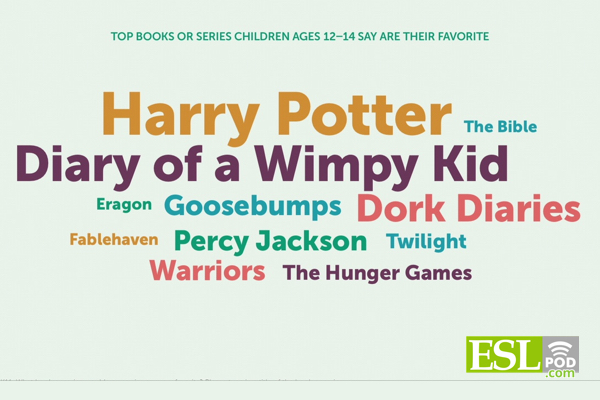 What books are most popular in English for younger readers? Here’s a list from a national survey (poll; set of questions) of American teenagers. One of these books may be good place to start your English reading. Harry Potter books. You probably already know about Harry Potter, but if you don’t, it is one of the most popular book series in English published in the last 50 years. This is the #1 book among young readers of all ages. Of course, if you’ve seen the movie, the books will be much easier for you to understand. The story (if you don’t know) is about a young boy who has special, magical powers. I recommend watching the movies first and then reading the books, but that’s not necessary. In fact, graphic novels are also a good place to look for reading material. I have read several Italian graphic novels – the photographs and drawings help you understand the language. Do you like the “superhero” movies like Batman or Spiderman? Try reading some of the comic books with those characters. Some comics even have apps allowing you to read them on your tablet or smartphone. Goosebumps. This is a series of dozens of books with scary stories. It is very popular among American schoolchildren. If you like “horror” stories, this is the perfect book series for you. Like all book series, once you read one book, the rest will become easier. Dork Diaries. I haven’t read this new series, but it is very popular with younger readers. Like Diary for a Wimpy Kid, it has funny stories about kids and their problems, along with drawings or illustrations. Many of these books are available in electronic format in English through websites such as Amazon.com and others. You can download a “sample” of the book (usually the first chapter or so) before you buy it. I do this all the time before I buy a book. There is one other obvious place to get reading and listening materials: our Unlimited English Membership. We have more than 10,000 pages of reading and 500 hours of listening that is easy and fun. Learn more here.